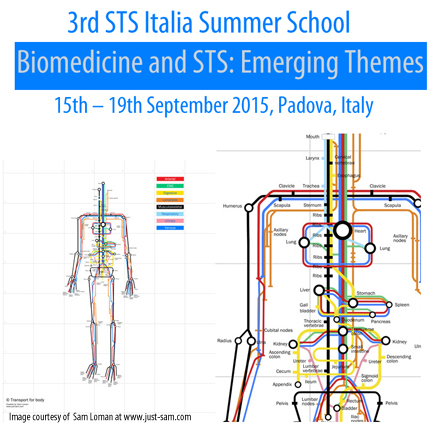 STS Italia, the Italian Society of Science and Technology Studies – in collaboration with the University of Padova, FISSPA Department – is organizing its 3rd Summer School, “Biomedicine and STS: Emerging Themes”, to be held in Padova (Italy) from September 15th to 19th, 2015.
gender, body and emerging configurations of biomedical technologies. The Summer School will offer PhD students and early career researchers the opportunity to interact with STS international scholars with a transdisciplinary background in social studies of science, technology and medicine. The Summer School will be organized around lectures and seminars. To make lessons more responsive, the participants will be engaged in seminars in which they will investigate the main themes of the Summer School working in small groups, through activities, discussions, inputs and examples. A group of scholars from STS Italia will participate in all the activities as facilitators. Moreover, the School will include a guided tour of the Museum of the History of Health and Medicine (Musme http://www.musme.padova.it/), in order to offer further materials and inspiration for workshop activities. All lectures and seminars will be in English. All participants are expected to attend the entire duration of the Summer School and a Certificate of Attendance will be provided at the end. Accommodation is not included in the fee. A list of selected hotels, B&B and budget accommodations will be provided to participants. This Summer School is intended for PhD students and junior researchers from different fields and disciplines (including science and technology studies, social study of health and medicine, sociology, anthropology, history, philosophy, and or related fields) whose research is related to biomedicine and who are interested in developing a STS sensibility toward this field of study. We also invite applications from students in the biomedical and life sciences, who are interested in exploring the relation between biomedicine and society. The number of participants is limited to 25 people. Candidates will be selected on the basis of their CV and research interests, maintaining a balanced participation in terms of gender and nationality of candidates. Three scholarships (covering the participation fee) will be available for talented students. Scholarship applicants must send a statement of purpose (maximum 500 words) explaining why attending this summer school would be important for their academic studies or career, outlining also the reasons why a scholarship is required. Scholarship recipients will be selected on the basis of documented academic performance, personal achievements and financial needs. Through both attending lectures and practising concepts, theories and empirical methods in group discussions and workshops, students will gain insights and suggestions on how to develop STS sensibility in relation to the study of biomedicine. Moreover, the school is intended to act as an intellectually and socially stimulating environment. Drawing upon previous experience, the school is organized to foster informal learning opportunities, sharing ideas, and developing networks among participants. 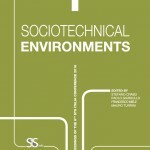 Moreover, a workshop on “how to get published” will be run by some members of the editorial board of Tecnoscienza – Italian Journal of Science & Technology Studies (http://www.tecnoscienza.net), where participants will have the opportunity to discuss their papers and submission process to the journal. The application form is available here. After space for personal details, the form includes a place to upload a short scientific CV (maximum 2 pages) and a statement of interest (maximum 500 words), which should describe the applicant’s current research and its relevance to the aims of the summer school. Finally, a statement of purpose (maximum 500 words) is mandatory only for scholarship applications. Applications deadline is June 30th, 2015. June 30th, 2015: Applications deadline. July 10th, 2015: Notification for participation and for scholarship eligibility. Please do not hesitate to contact the Organizing Committee via email at summerschool@stsitalia.org for any further questions regarding the school. CALL FOR PAPER | Special Issue on Digital Circulation: The Digital Life of Things and Media Technologies | Guest Editors: Gabriele Balbi (University of Lugano), Alessandro Delfanti (UCSD), Paolo Magaudda (University of Padova). Deadline for abstract submissions: June 15 th , 2015. Call for Papers for a Workshop at the University of Technology in Berlin | 14th to 16th September 2014 | Design, Interaction, and Technologically Dense Environments. Methodological challenges to entangled work practices. CALL FOR PAPER: “Designing Things Together: Intersections of Co-Design and Actor-Network Theory”, CoDesign – International Journal of CoCreation in Design and the Arts. Guest editors: Cristiano Storni, Dagny Stuedahl, Thomas Binder and Per Linde.